Recently I had to troubleshoot an issue where loading and unloading tape drives in a tape library was causing trouble. Parallel operations executed on the same library changer device caused a subset of the operations to fail leading to aborted sessions. A Linux Media Agent controlling the library changer reported the following error. I’ve noticed a slightly different error message after changing the primary Media Agent for the tape library to a Windows host. The Windows error message was looking familiar. I’ve tried a modification of the omnirc on the Media Agent hosts responsible for the robot control and it resolved the issue. 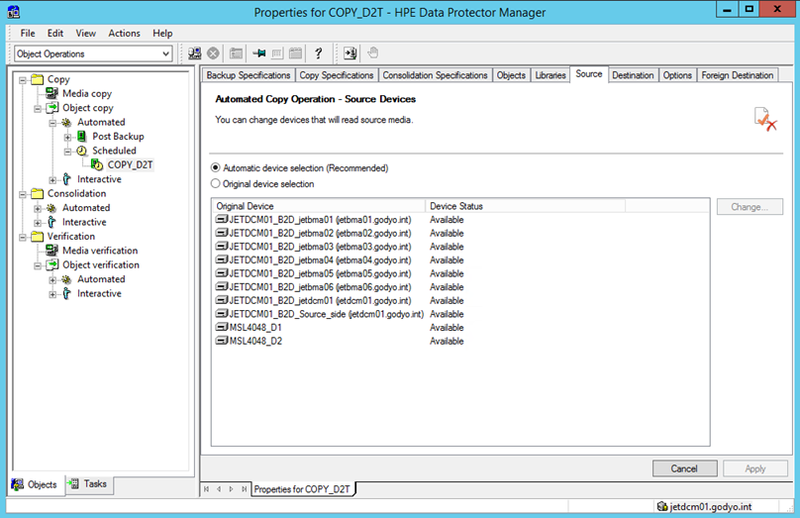 When using Object Copy or Replication in Data Protector it is important to ensure the right Media Agent is reading the source data. This ensures the data stream is either kept locally on a specific Media Agent or is using the right path through the network. You could either use a static re-mapping of Source devices within each Copy Spec or use Device Policies globally. This could be a very time consuming task in a configuration with dozens of devices and multiple Copy specs. 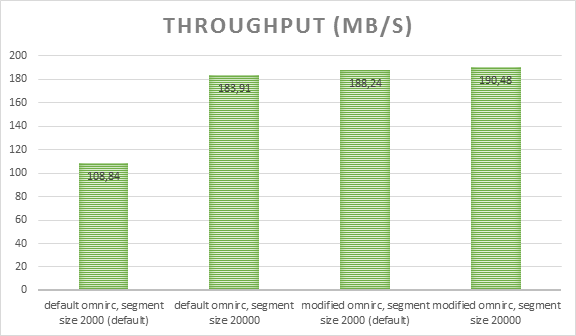 This is commonly seen in larger StoreOnce Catalyst, Data Domain Boost or File Library implementations. You need to select every possible Source device that should not be used during the operation and Change it to a different Source device. In this example only the device JETDCM01_B2D_jetdcm01 should replace all other devices. Please note: B2D Source side devices should never be used during Object Copy/Replication. They must be replaced accordingly. Replacing a Source device with a device from a different library will cause Mount Requests. The benefit of using Device Policies is that this is a one-time operation. All devices within a specific device (B2D, File Library, Tape Library) use the same Device Tag. Then assign the Copy Policy to control which Media Agent should be used during Object Copy/Replication. This is possible as a group operation on multiple Devices. Even B2D Source side devices are supported for this operation. Please note: B2D Source side device should never be used during Object Copy/Replication. They must be replaced accordingly. 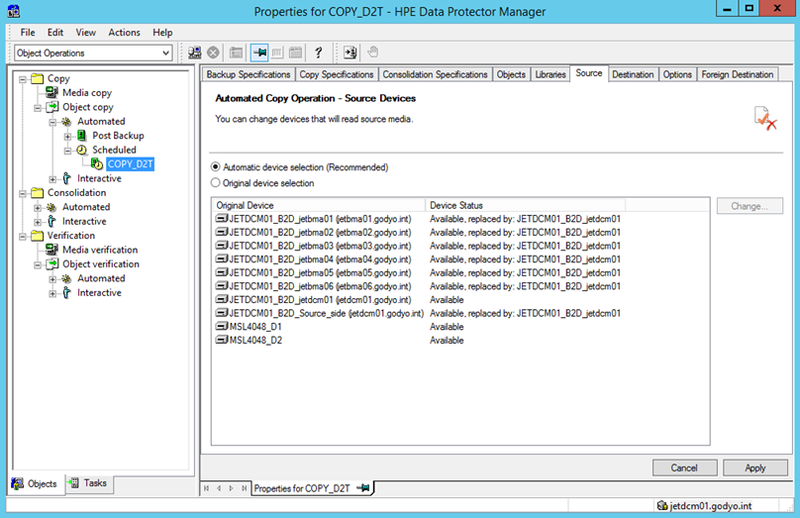 The configuration options of Device Policies on Source side devices has been removed in Data Protector A.10.01 (QCCR2A75017). This should be fixed in QCCR2A75018 soon. If the Device Policies are configured no further manual modification in the Copy spec is required. A few recommended global options relevant for Object Copy using either Device Policies and/or Static re-mapping. The content of this post has been obsoleted/removed. I’ve included the information in the continuously updated page http://www.syncer.de/?page_id=944. I think you’ll find it very useful. I strongly recommend to bookmark this page and check by regularly. 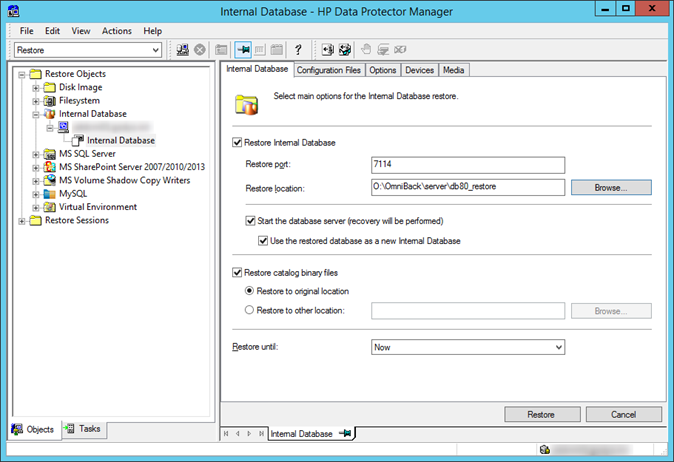 Starting with Data Protector A.09.05 Red Hat Enterprise Linux 7.0 and 7.1 is now a supported Cell Manager platform. But running the regular installation procedure on a fresh RHEL 7.1 system does not work, even with all requirements met. The installation script omnisetup.sh -CM -IS will fail during certificate generation phase. Initializing Internal Database version A.09.00... Done! When looking at the logs I found the root cause in /opt/omni/sbin/omnigencert.pl. The function ParseIpData() is not able to get any IP addresses from the /sbin/ifconfig output on the system. 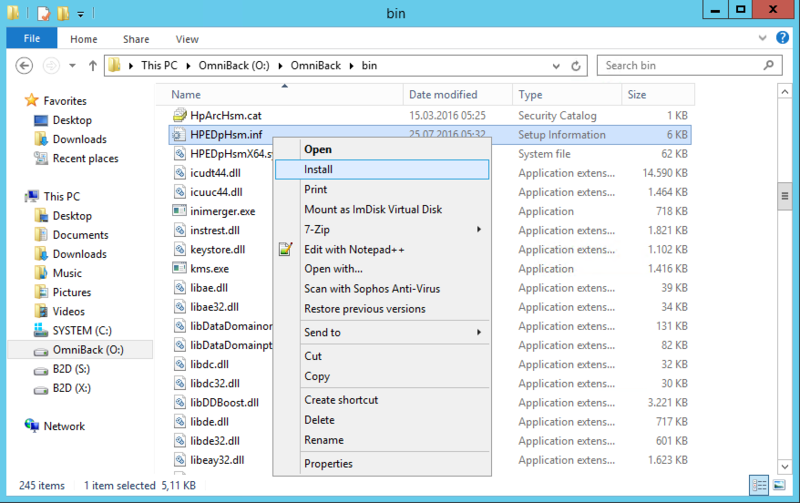 The command is part of net-tools-2.0-0.17.20131004git.el7.x86_64 required for installation. The ifconfig output is different compared to previous RHEL versions causing parsing failures. I’ve developed a patch that resolves the parsing errors. You can download the patch and the modified omnigencert.pl here. Just copy the modified omnigencert.pl from the tarball to /opt/omni/sbin after OB2-CS-A.09.00-1.x86_64 is installed and before the certificate creation starts. The installation will go through smoothly. Update: The Hewlett Packard Enterprise support provides a fix for this issue with SSPLNX900_005.